Nothing says fall quite like decorative gourds and Jack O&apos; Lanterns. Luckily for me, Cumberland Valley is home of the largest gourd crafting facility in the United States - Meadowbrooke Gourds. 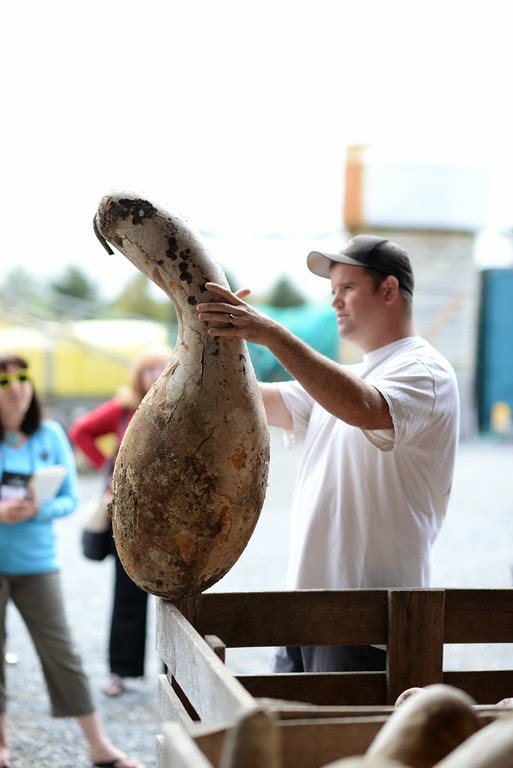 If you&apos;re not familiar with Meadowbrooke Gourds, you can take a free public tour to learn more about this unique facility. Tours are offered every Tuesday at 2pm and on special event weekends throughout the year. The Meadowbrooke Gourd experience begins before you even arrive. Located on the outskirts of Carlisle, y ou will enjoy the wonderful fall foliage as you wind through back roads and farmlands. 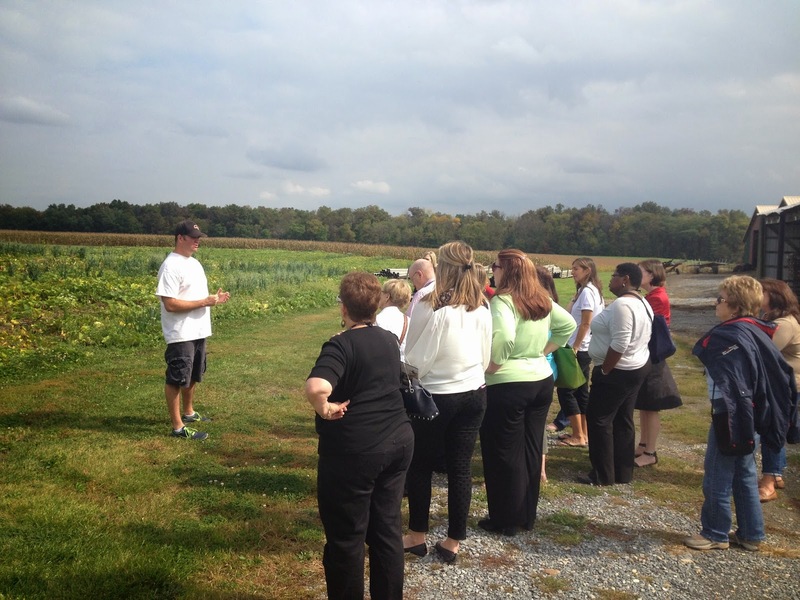 Meadowbrooke Gourds is located on over 200 acres of farmland. 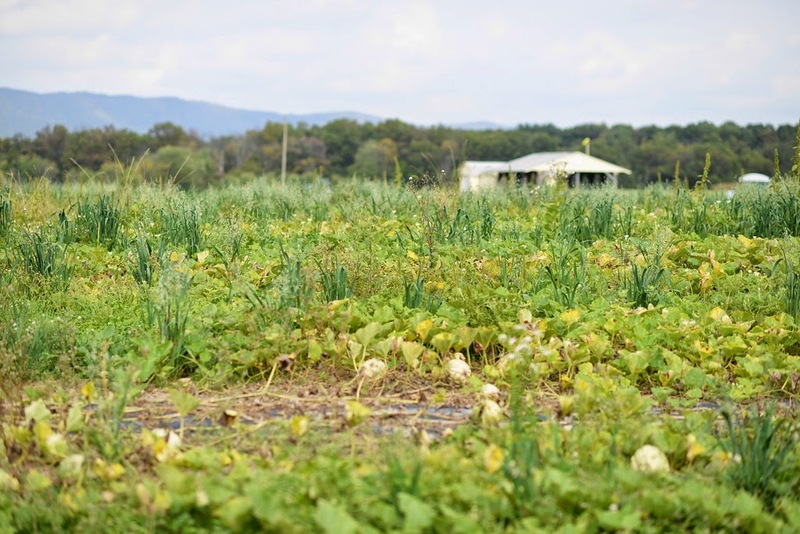 In order to keep healthy gourd crops, crops are rotated in the fields, which means visitors see a variety of gourds, corn and soybeans growing around the farm. Meadowbrooke Gourds grows a variety of gourds, and experiments with crossbreeding varieties to yield gourds that are stronger shelled or different shapes. Each gourd plant starts in a greenhouse and is transplanted outside. Gourds are hand pollinated and planted. After the first frost, they are removed from their vine and left in the field for the entire winter! During this time they dry and rot. 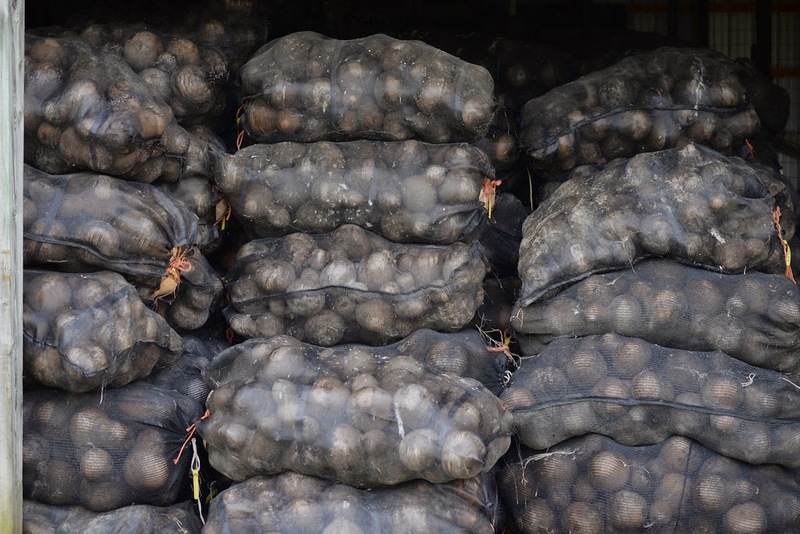 In the spring the gourds are collected and bagged by size and shape in the warehouse. Gourds may sit in the warehouse for ten years or more before being crafted. This is especially true of large gourds, like the one pictured to the right, as these gourds are typically reserved for special orders. 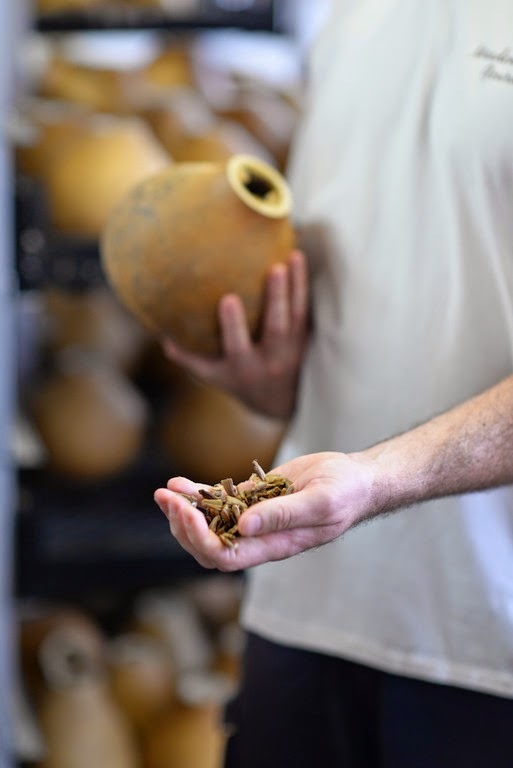 In some instances, the larger gourds are crafted into custom instruments for musicians! 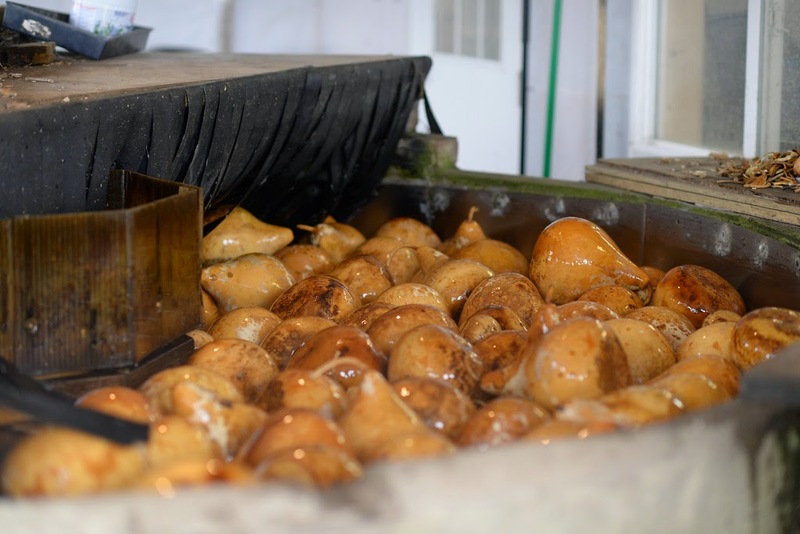 dirt, rot and skin of the gourds are removed in this step. After being washed, the gourds are moved inside. Gourds that will have holes cut in them for faces, luminaries or other special adornments have the insides cleaned out with a pressure washer. This removes the seeds and other goop from the inside of each gourd. The final step in the washing process is drying the gourds. 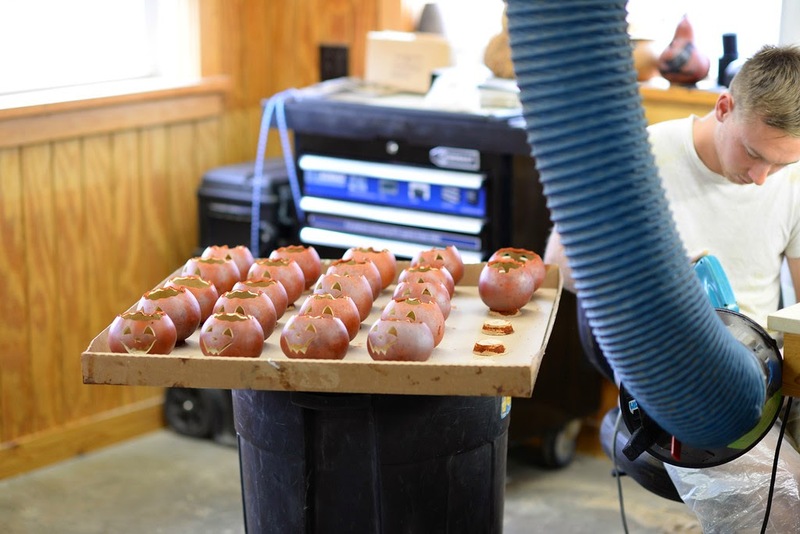 The gourds are placed on racks according to size and put in a warm, dry room to remove the moisture and prevent future molding. At this time, stems that were knocked off in the washer are glued back on to the gourds. The last step is the crafting of the gourds. The gourds undergo a variety of treatments such as sanding the bottom to make them stand upright, staining the gourds for color, cutting out faces or shapes and adding adornments like ribbons or wings. Each step is completed by hand, making each gourd a little bit different. Even the adornments, like felt hats for the snowmen, are created by hand. After the gourds are completed, they are packaged and placed in the warehouse. Most gourds are sold wholesale, and are shipped to 49 of 50 states in the US. Some gourds are also sent directly to consumers who purchase them through the website or catalog. 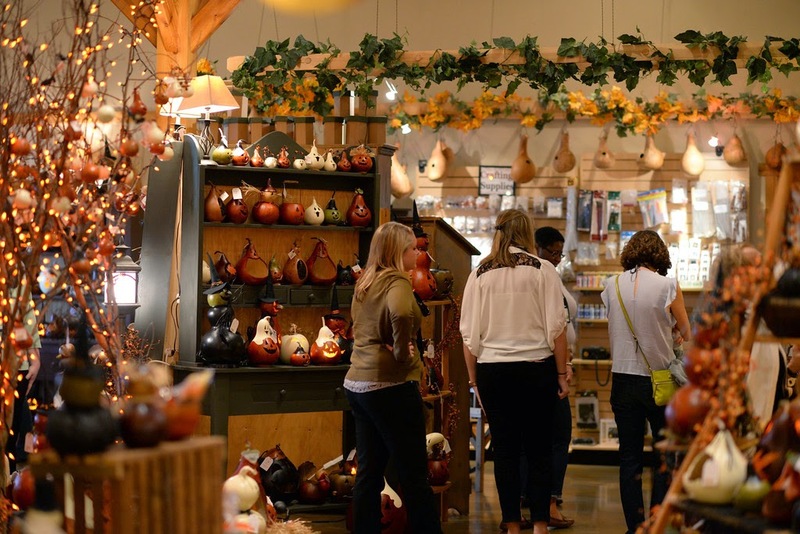 Finally, a small amount of gourds are sold in the Meadowbrooke Gourds store, which is full of gourds for every season. A walk around this cozy shop reveals a variety of fun finds: gourd Easter baskets, eggs, bunnies and chicks for Easter; Jack O&apos; Lanterns, scarecrows and zombies for Halloween; cornucopias, leaf luminaries and turkeys for Thanksgiving; angels, snowmen and Christmas ornaments for Christmas and a variety of cats, bird houses and luminaries for all seasons. It&apos;s hard to pick just one! In addition to the Tuesday tours, Meadowbrooke Gourds also hosts a variety of seasonal special weekends. Join them in the spring for a gourd Easter egg hunt, enter your gourd in the floating gourd race during the Summer Celebration or enjoy a horse-drawn hay ride during the Fall Festival. 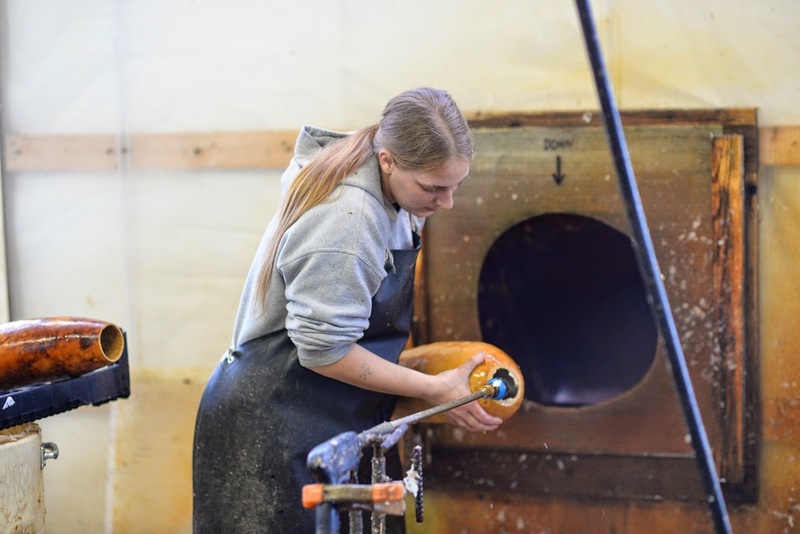 Each event varies from year to year, but typically includes sales of Oops Gourds, food, entertainment and special classes for creating your own gourd.